An average of 40% to 45% of Americans create one or more new years resolution each year. As time goes by resolutions tend to fade in achieving the goals originally set out by the individual. However, it research has shown that people who make resolutions are still considered ten times more likely to attain their goals than those that do not explicitly make resolutions. 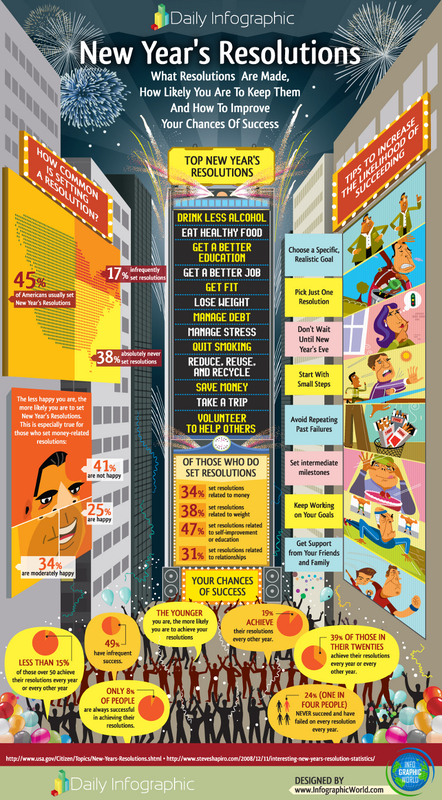 – 45% of Americans usually make New Year’s resolutions. – 17% of Americans infrequently make New Year’s resolutions. – 38% of Americans absolutely never make New Year’s resolutions. – 8% of Americans successfully achieve their resolution. – 49% of Americans have infrequent success with their resolution. An estimated 40% of individuals in their 20’s will achieve their New Year’s resolution. Only 14% of individuals 50 and over achieve their resolution each year.